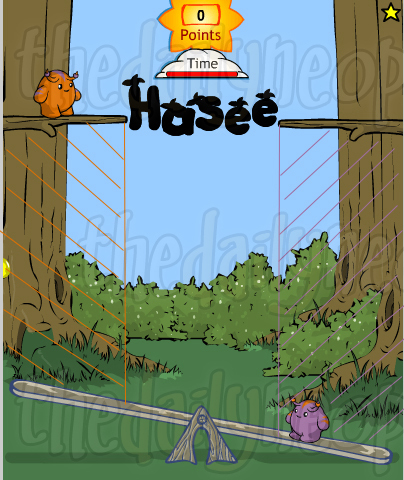 Hasee Bounce is a classic game of see-saw... with a twist! 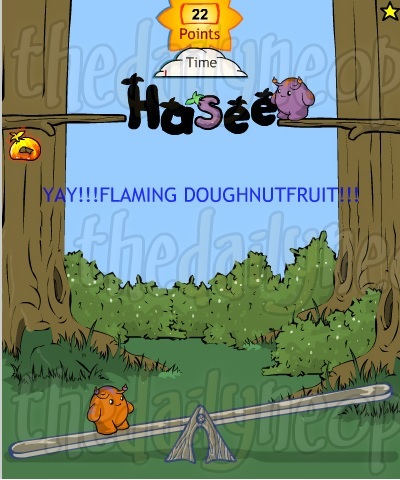 Help Jimmi and Woogie collect tasty doughnutfruit to satisfy even the biggest of Hasee appetites. Keep an eye on the clock and watch out for those nasty slime balls and dung heaps! 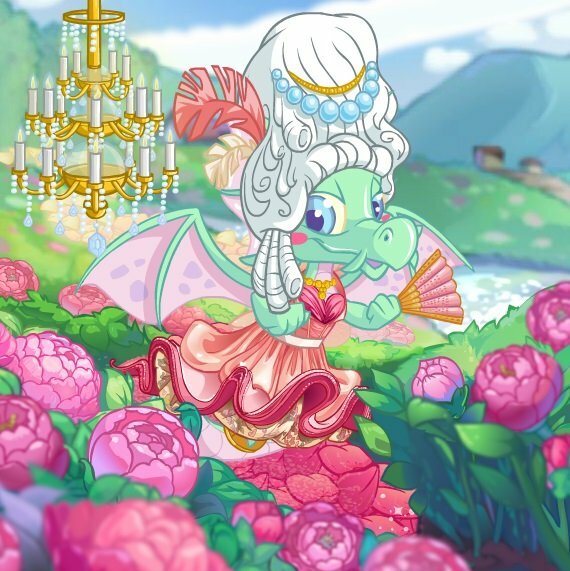 **There's also been a rumour that there's also a Faerie doughnutfruit available to collect in the game that's worth 80 points, however, we've yet to obtain a photo of one in the wild. 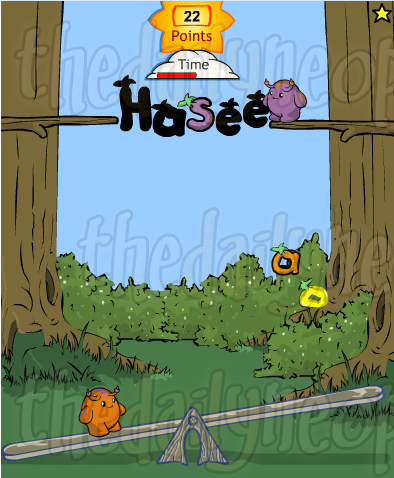 Also available to collect in the game are coloured letters that spell H-A-S-E-E. Each letter will be either purple or orange and can only be collected by the Hasee of the same colour. Each letter collected adds +2 seconds to the game timer and two points to your game score. 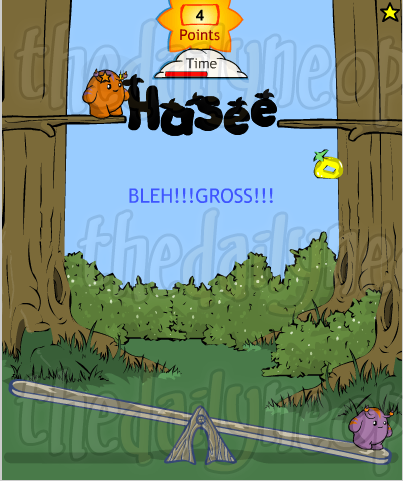 Collecting the entire word "HASEE" will award an additional +20 second bonus if the word is collected in multiple colours, and a +40 second bonus if all the letters collected are a single colour. These time bonuses are awarded each time the set of letters is collected during your game, so you can collect the time bonus multiple times within the same game. (points of first fruit x 1) + (points of second fruit x 2) + (points of third item x 3), etc. The only thing the multiplier doesn't affect is your time bonus, so even if you collect a letter after collecting other letters or doughnutfruit, it will still only award you a +2 second bonus. Hitting any of these three items will stun whichever Hasee hits it for a brief period of time and cause it to let out a small grunt of disgust. During this time, the Hasee will be unable to collect any other items (though will still be able to bounce up and down), and will have a ring of stars around their head until the stun effect wears off. Typing doughnutfruit at any time during gameplay will fully reset the clock once per game. Clicking the little yellow star in the upper right-hand corner immediately ends the game, allowing you to restart or send your score without having to wait for the timer to tick down. Once a letter as been collected, it won't show up again until you finish the word "HASEE" and it resets. So if you collect an H, another won't show up in the game until you've finished the word, get your time bonus, and started it again. The exception is E's because there are two of them in the word, but once two have been collected, they also will not show up anymore until you've collected all the other letters and the word resets. This is especially important if you're trying to collect all of one colour because if you accidentally collect the wrong one, you won't have an opportunity to re-collect one of the other colour until the word is finished and reset. 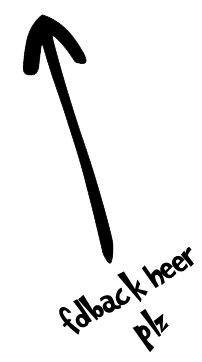 When it comes to controlling the Hasees, everyone will have their preference, but it generally is easier to control the left and right motion of the Hasees with the arrow keys. This especially true when they're in the air between the branch and the see-saw because of how fast they drop and how small the play area is. It's quite easy to move your mouse completely outside of the play area and momentarily lose control of your Hasees. One advantage to using the mouse, however, is when it comes time to use the time cheat. If you don't use the keyboard during gameplay, you can type doughnutfrui at the beginning of the game during the countdown timer, so all you have to do when you want the time reset is just to hit the last letter -t, making it quicker to activate than having to type the whole word when you want to use it, which is usually when your timer is getting low. When aiming to collect multiple items in a single turn, try to collect the item worth the most points last, if possible. This will maximize the points the multiplier can award. Though it would be hard to test definitively, it is believed there might be a way to get better doughnutfruits to randomly appear throughout the game. When the countdown starts at 3, immediately type in "hasee" until you get to 1, then type in "fishnegg" or "faerienegg." Supposedly, it will make more of the special doughnutfruits and more letters appear than otherwise would. If you type "pleasegivemeonemillionneopointsthankyouhasees" the game pauses and Hasees spin around as the million counts down. It doesn't have any effect on the game but it's fun to watch. It is easier to use the keyboard than the mouse. You'll have more balanced gameplay this way, and you'll be needing two hands with the keyboard (left hand for the spacebar, and right hand for the arrow keys); rather than playing with only one hand using the mouse, which is actually frustrating. Though the game is fairly simple to learn, it takes practice to perfect your score. Try the different controls to see what works for you, and experiment collecting items in different orders to maximize points. Make sure to use the extra time cheat, and you'll be on your way to a trophy in no time!